The State Library of NSW began as a small subscription library in the 1820s for colonials who were desperate to read books. From these early beginnings it became the world class, global library it is today. In December 1827 operations began in rented premises in Pitt Street, and for the next two years the Library led a peripatetic existence—a few years in George Street, then Bridge Street, Macquarie Street and Macquarie Place. In 1845 it finally moved into its own new building on the corner of Bent and Macquarie Streets, approximately where the Aurora Place development now stands. 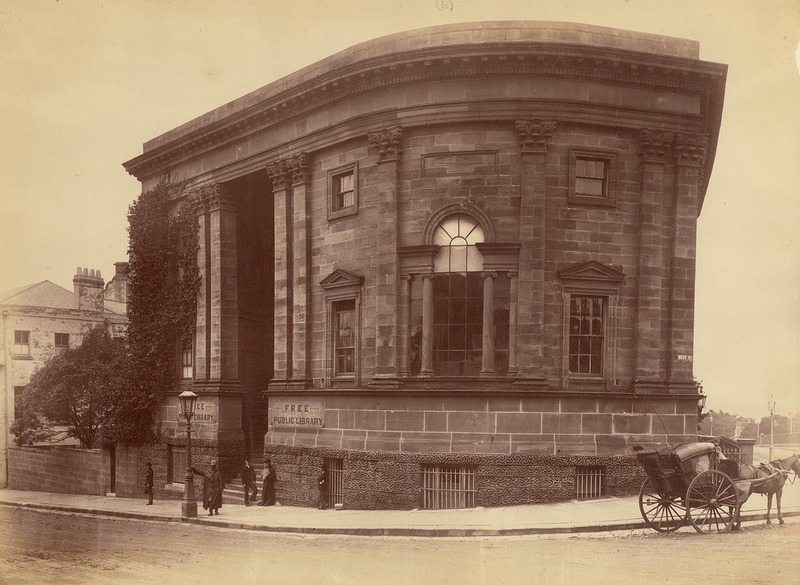 By 1869 the subscription library was hopelessly in debt, and the New South Wales Government was persuaded to buy it for £5100 (£1500 for the books and £3600 for the building). In September 1869, the Sydney Free Public Library opened its doors with a stock of 20 000 volumes. The Library soon outgrew its premises, and a new wing was built in the mid-1880s. By the turn of the century this too was outgrown, and plans were prepared for a completely new ‘national’ library building. The stimulus for this was David Scott Mitchell’s offer of his immense and unrivalled collection of Australiana to the people of New South Wales. One condition of his offer was that a new building be erected to house the collection as a separate library. Work on the Mitchell Wing started in 1906 and was completed in 1910. It houses the Mitchell Library reading rooms, work areas and galleries. It was another 20 years before more building took place on the site of the national library. The Dixson Wing, completed in 1929, was added to the south side of the Mitchell Wing to provide storage and gallery space for the extensive collection of historical paintings presented by Sir William Dixson. In 1939 work began on the central portion of the building, which includes the portico, the ornate vestibule with its reproduction of the Tasman Map in marble mosaic, and the main reading room. The building was ready for occupation in June 1942, and the Library was at last under one roof. In 1964, the final section of the sandstone Mitchell Wing, uniform in style, was added to the south east corner. Within 10 years the Library had outgrown this space too. Work began on the Macquarie Street Wing in 1983 and it was opened in 1988 (Australia’s bicentenary) by Her Majesty Queen Elizabeth II in company with Prince Philip. The new building fronts Macquarie Street and links up with the Mitchell Wing above ground by an unobtrusive first-floor bridge and below ground at a number of points. Mr Andrew Andersons, the design architect, had excelled himself in designing an attractive and welcoming building flooded with natural light that will continue to endear itself to countless Library users. 1826: The Australian Subscription Library, precursor of the State Library of NSW, opens in Pitt Street. It moves three times until finding a permanent home on Bent Street in 1845. 1869: The NSW Government assumes responsibility for the Library, which becomes the Sydney Free Public Library. Focus changes to a reference collection, with a strong emphasis on Australian material. 1895: The name changes to the Public Library of New South Wales, articulating its role and the importance of its collection. 1898: David Scott Mitchell offers his entire Australian collection and a substantial endowment to the NSW Government on the condition a new building in constructed to house it. 1910: The new Mitchell Library (the northwest corner which now houses the Friends Room opens to the public on 9 March with a reading room for the study of items from the Mitchell Collection. 1919: Sir William Dixson offers to present a collection of paintings to the Public Library, provided a wing is constructed to house it. 1929: The Dixson Wing (the southwest corner facing the statue of Matthew Flinders) is opened. 1942: The Public Library extensions to the Mitchell Library Building are opened, including the magnificent vestibule, glassed ceiling reading room and the Shakespeare Room. The collections, staff and services of the Public Library are relocated from Bent Street to the expanded building, now called the Public Library of New South Wales. The Mitchell and Dixson collections continue to be used in the original Mitchell Reading Room and the public library collections are read in the Reference Library Reading Room (known as the Mitchell Library Reading Room since 1988). 1964: Mitchell Library Building completed with the construction of the Domain Wing on the southeast corner. 1975: The name changes to the State Library of New South Wales. 1988: The Macquarie Street wing opens with a new reading room (now the State Reference Library). The Reference Library Reading Room becomes the Mitchell Library Reading Room in which the now very large Mitchell Library Collection, including special collections, are studied by those holding a reader’s ticket. 2013: AMAZE: The Michael Crouch Gallery opened in the Mitchell Building. 2014: The State Reference Library is renamed the Governor Marie Bashir Reading Room. 2018: The Library completes its first major building project in the Mitchell in over 50 years — opening the Michael Crouch Family Galleries and John B Fairfax Learning Centre.